Olotu Square Founder of Olotu Square, Bruce Lucas is a passionate creator, community manager, and businessman. Listen to his story about how he and his team train future developers and work with partner companies to employ them. This business model has enabled Olotu Square to offer free trainings to anyone interested and, thus, is helping to transform the local economy in River State. Bruce, how did you come up with the idea to open a tech hub? I studied Computer Science and started my first software company while I was still a student. I came across an NGO that focuses on training youth in tech skills across 40 countries. I found it to be a very interesting model and I wanted to explore it more. That's how I first encountered hubs and coworking places and I got the idea to start a tech hub of my own. I think with this model we can really have an impact on the local developer ecosystem and economy. Do you remember what was the turning point for you when you decided to create a community space? When Sols247 showed their "before" and "after" pictures of people that were able to build solar panels as a result of training they received. I wanted to see this happening in Nigeria as soon as possible and asked Sols247 to branch out. But the negotiations took longer than expected and I was too excited to wait. I had my own company at that time and started by converting my desk to a hot desk that people could share (laugh). Slowly it became what is now Olotu Square. It seems that you're very clear on your vision for the future. What are your priorities? Definitely. For one, we can see that many people are interested in the training itself. I find it very important to offer them an opportunity to further develop their skills when they graduate from our courses. That's why we outsource our graduates to IT companies. This combination of training and employment opportunities is attractive to both the attendees as well as potential corporate partners and sponsors. Second, Rivers State has historically been dependant on the oil industry but its performance is declining over time. Companies want to diversify their portfolio and IT is of high interest to them. We have this grant program called "PAQ session" that focuses on "tech as a new oil". We want to be an active part of this industry mindshift. How are you able to offer trainings for free? Most of our training programs really are free for participants (with the exception of MasterClasses that we charge a small fee for). We have support from Google (we hosted #HashCode, Google Next Extended, Google was a partner at Andela Learning Community, etc.) and other sponsors on an event-to-event basis. The solutions that we’re able to provide with our talent pool are of commercial value and help support our non-commercial activities. How big is the Olotu Square team? There is a core management team of ~10 people. I'm the founder. We have Theodora Isola who is leading our community efforts and is also a Women In Tech Africa organizer, WTM Lead, and Django Girls mentor. In Web Development, Administration, Business Development, and Operations we employ another 8 people. What about other local stakeholders, how are you cooperating with them? Well, there wasn't an established developer community before we started Olotu Square in 2016. Growing the local ecosystem remains as one of my priorities. We partner with local GDGs. 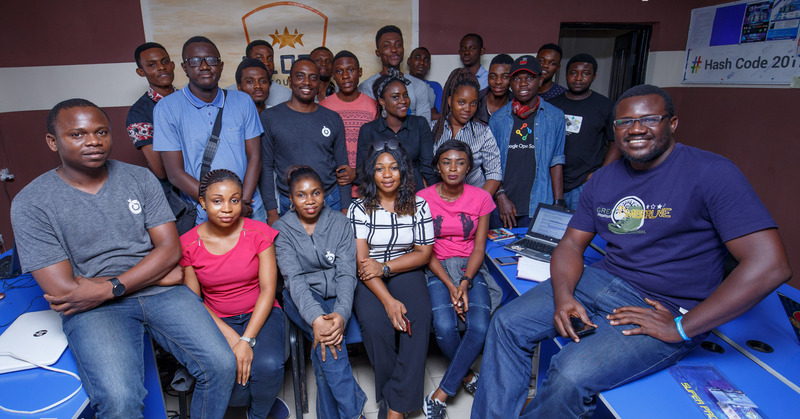 A lot of developer meetups are happening in Lagos and now we can offer a space for meetups in Rivers State as well. NGOs are starting to approach us and offering to support our activities. Important partners are ForLoop (developer meetup community) and Andela (global engineering organization that trains and then outsources software developers). It seems that you cover a wide range of topics in your trainings. How do you do choose your content? Besides trying to cover the latest topics and releases, we focus on what's relevant for us locally. To give you an example, we had a meetup on "intellectual property ownership of software products". We invited lawyers, business consultants, tech developers, and over 200 people registered to attend and discuss this important topic in the Nigerian legal system. Bruce, have you yourself ever felt overwhelmed as a community organizer? I just started a year ago, so I don't yet feel tired. Besides, I've been active in communities since my studies. I was in “Junior Scientists” and served as President of the Nigeria Computer Society, South-South. I was providing services to other professionals and my network helped with the early start of Olotu Square. I use my personal contacts when looking for speakers and sponsorship. Besides, I really like what I do. This excitement keeps me going. According to your experience, what are the key factors to build a sustainable community? Having great speakers. That's one of the key factors that engages people. Based on feedback we collect, a good speaker means 70-80% attendance conversion rate for the next meetup. You have to find ways to support talent. To give you an example: Benny Odumu is a Graphic Designer based in Abuja, Nigeria. He reached out to us saying he wanted to give a training in Port Harcourt. We sponsored the training by offering Olotu Square space for free and advertised the event. I myself facilitated one UI/UX class and offered internship and employment opportunities with Olotu Square to participants. While we have our own programs, we also want to support others who are doing similar things which increases the impact that we have. In your opinion, what else could Google Developers do to support community organizers? Let me put it this way. Most IT solutions for corporations are being built by other companies. GDGs are developer communities that train individuals, but when a company is looking for a partner to develop solutions, they don't come to these communities. They approach other ICT companies, corporate entities that have the necessary infrastructure or organizational structure to support the solution for years. What are you looking forward to in the 2018? We're looking forward to develop strong partnership with local and global stakeholders like Andela.com to create more employment opportunities for our graduates. We're also looking for grants / venture investors to support us in this journey.